Isocitrate dehydrogenase from yeast (top) and bacteria (bottom). Sugar tastes great. This should be no surprise, though, since glucose is the central fuel used by oxygen-breathing organisms. Sugar is broken down in the central catabolic pathways of glycolysis and the citric acid cycle, and ultimately used to construct ATP. The enzymes in these pathways systematically break down glucose molecules into their component parts, capturing the energy of disassembly at each step. Isocitrate dehydrogenase performs the third reaction in the citric acid cycle, which releases one of the carbon atoms as carbon dioxide. In the process, two hydrogens are also removed. One of these, in the form of a hydride, is transferred to the carrier NAD (or NADP), and will be used later to power the rotation of ATP synthase. In our cells, this complicated reaction is performed by a complex enzyme, composed of eight chains (the yeast enzyme is shown at the top from PDB entry 3blw ). 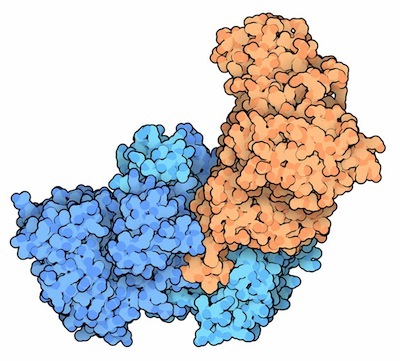 Four catalytic chains (colored turquoise here) perform the reaction, and four regulatory chains (colored dark blue here) turn the enzyme on and off based on the levels of ATP and ADP in our cells. Bacteria take a simpler approach. They build a smaller enzyme composed of two identical chains, forming two identical active sites (PDB entry 9icd , shown at the bottom). Our cells also build a small version of isocitrate dehydrogenase, which performs this same reaction in the cell cytoplasm, intercoverting isocitrate and alpha-ketoglutarate when they are needed for synthetic tasks. 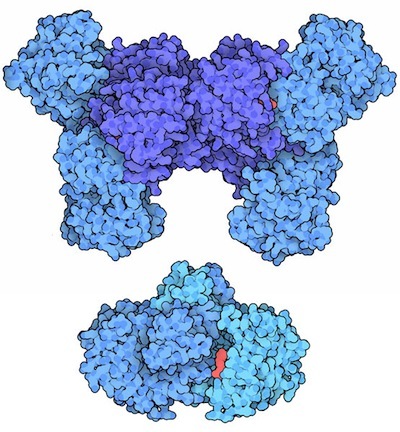 Isocitrate dehydrogenase kinase/phosphatase (orange) bound to isocitrate dehydrogenase. The bacterial isocitrate dehydrogenase is not controlled by the levels of ATP and ADP the way our mitochondrial enzyme is, but bacteria still need to be able to turn their enzyme off when there is enough ATP. Bacteria regulate their isocitrate dehydrogenases by adding a phosphate to the protein chain, which blocks the reaction. The enzyme isocitrate dehydrogenase kinase/phosphatase (PDB entry 3lcb , shown here in orange) performs both reactions: adding a phosphate to turn off the enzyme and removing it to activate the enzyme. It decides which reaction is appropriate based on the level of AMP in the cell: when levels are high, AMP binds to a regulatory site, activating the phosphate-removing machinery, otherwise it is active as a phosphate-adding kinase. Crystallographers have examined many steps in the reaction performed by isocitrate dehydrogenase. The first structures studied the complex of the enzyme with each of its separate substrates and products: isocitrate and magnesium (8icd ), NADP (9icd ), and alpha-ketoglutarate (1ika ), as well as the apo enzyme (3icd ), and the inactive phosphorylated enzyme (4icd ). To examine the details of the reaction itself, however, special experimental techniques were used. 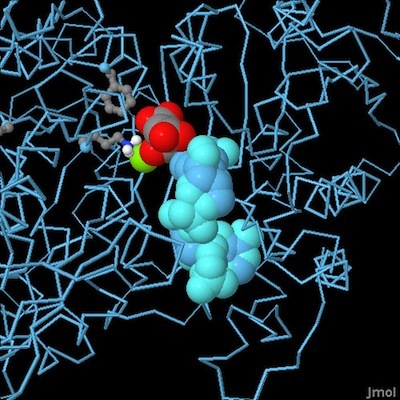 By carefully synchronizing the addition of substrates to mutant forms of the enzyme, and then using Laue diffraction to gather crystallographic data in milliseconds, researchers were able observe the unstable intermediates in the reaction. For instance, the Y160F mutant slows down the first step of the reaction (1ide ), so the structure shows the bound complex of isocitrate, NADP and magnesium, caught before they have a chance to react. The K230M mutant slows down the second step, revealing the structure of the intermediate oxalosuccinate before it loses the carbon dioxide (1idc ). Click on the image to see an interactive Jmol of these structures. Structures are available for most of the enzymes in the citric acid cycle. Can you find them in the PDB? Isocitrate dehydrogenase can distinguish between the two stereoisomers of isocitrate. It does this by surrounding isocitrate and forming specific interactions with each of its functional groups. Can you find the amino acids in the protein that are important for these interactions? What role does the metal ion play? Be sure to use the biological unit when you look at this interaction, since the active site is formed between the two subunits. J. Zheng and Z. Jia (2010) Structure of the bifunctional isocitrate dehydrogenase kinase/phosphatase. Nature 465, 961-965. A. B. Taylor, G. Hu, P. J. Hart and L. McAlister-Henn (2008) Allosteric motions in structures of yeast NAD+-specific isocitrate dehydrogenase. Journal of Biological Chemistry 283, 10872-10880. J. M. Bolduc, D. H. Dyer, W. G. Scott, P. Singer, R. M. Sweet, D. E. Koshland Jr. and B. L. Stoddard (1995) Mutagenesis and Laue structure of enzyme intermediates: isocitrate dehydrogenase. Science 268, 1312-1318. J. H. Hurley, A. M. Dean, D. E. Koshland Jr. and R. M. Stroud (1991) Catalytic mechanism of NADP+-dependent isocitrate dehydrogenase: implications from the structures of magnesium-isocitrate and NADP+ complexes. Biochemistry 30, 8671-8678.